Let's say you've got a problem of a scientific nature: you've got a group of rogue atoms wreaking havoc in your petri dish, and you need to get rid of them. They've managed to convert certain structures into deadly traps, and are content to just hang around like a college grad who just won't move out. Who do you send in to fix this problem? If you answered "Pandas", I'd like you to get your head checked. But first, check out this game. 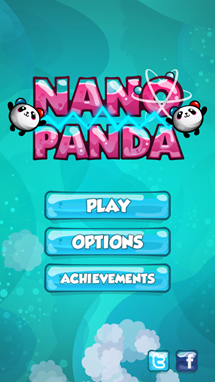 Nano Panda comes at us from developer Unit9 Apps, who've put together a fun little puzzling game that's managed to capture a certain... playfulness about it. 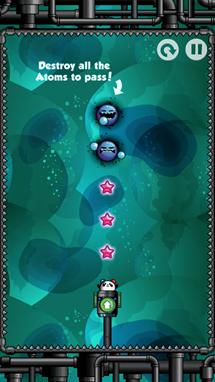 Nano Panda's controls are quite simple: you click a launch button to send a panda flying, and the game's physics engine takes care of the rest. 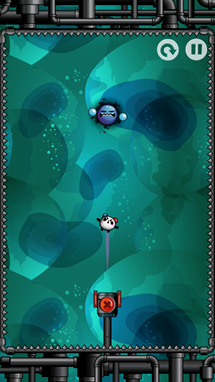 Multiple pandas on the playing field attract each other by an electric tether, which serve as the game's main mechanic. By taking advantage of this attraction, you maneuver the pandas to collect stars and destroy bad atoms. 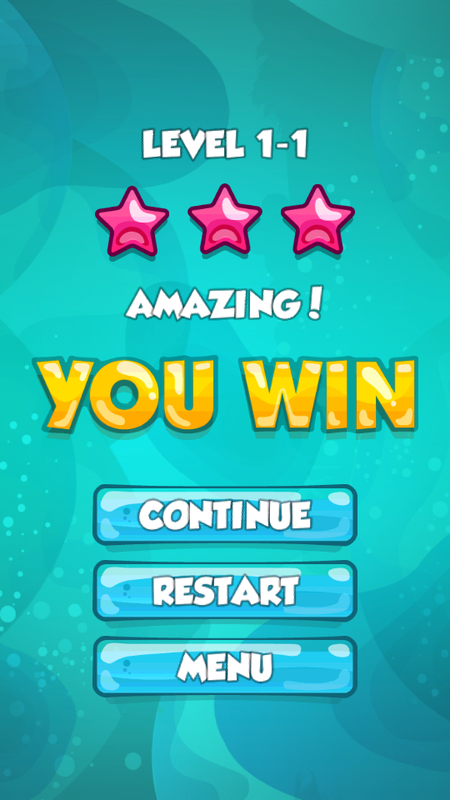 At first, I dismissed Nano Panda as a mishmash of a number of other games: most noticeably, it's got the level/star system from Angry Birds and the physics from Cut The Rope. However, once I began playing, I actually had a surprising amount of fun. Launching and tethering those pandas is actually quite entertaining, and figuring out the solution to the physics puzzles is quite satisfying. Sometimes the solutions to the levels are surprisingly simple, while others take a bit of pondering. 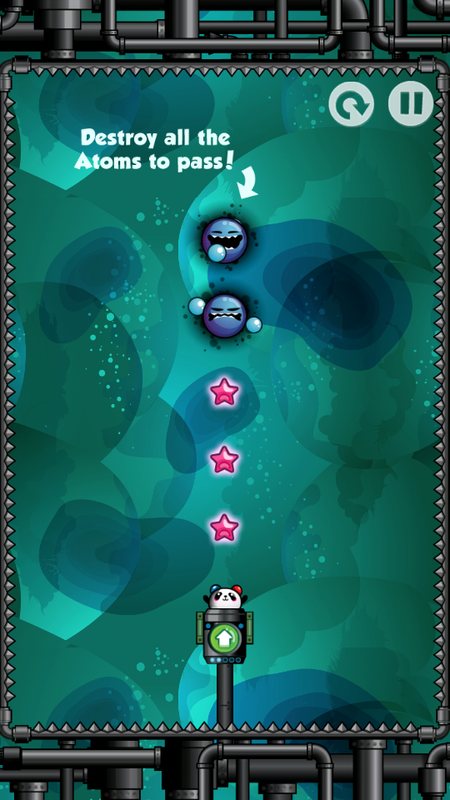 The ultimate goal is to destroy each of the bad atoms in the level, but there's a side challenge of collecting all the stars in the level. 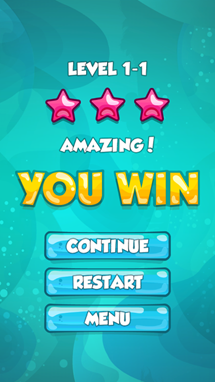 Instead of an Angry Birds-style "stars" score scale, one star collected is equal to one star on the scoreboard. 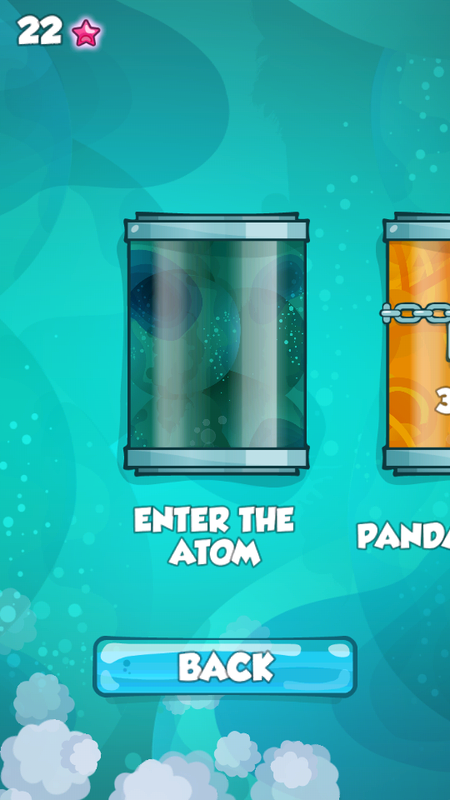 There are three in each level, which adds some replayability. 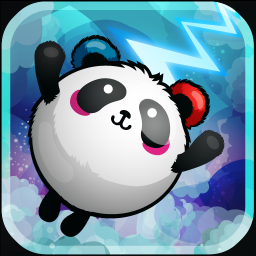 As levels progress, new objects are introduced, such as magnetic attractors, that will cause pandas to orbit them. This adds a bit more challenge while giving players the ability to influence their play. 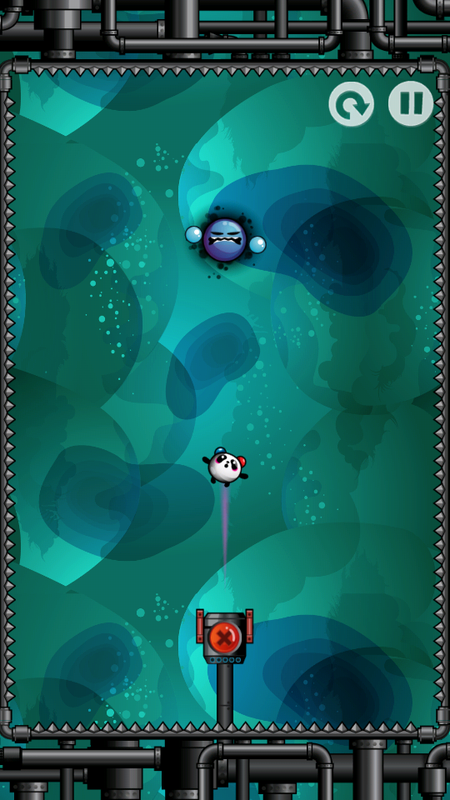 Later levels just look absolutely chaotic, but they become a bit simpler with some trial-and-error. Unfortunately, there seems to be a bit of a loading time between each reload, but it isn't too bad. It's just a bit of a detriment to a game that relies on frequent resets to facilitate trial-and-error. I found myself actually pumping my fist when I got past some of the more difficult puzzles, which made me thankful that I work from home. There's a real sense of satisfaction when you complete a puzzle, which is something I found I didn't have in Angry Birds. I'm guessing that the presence of this satisfaction is what allows people to get addicted to these type of games: if you feel like there's no point in playing, why open the app? There's a large amount of self-imposed challenge, here, as well. 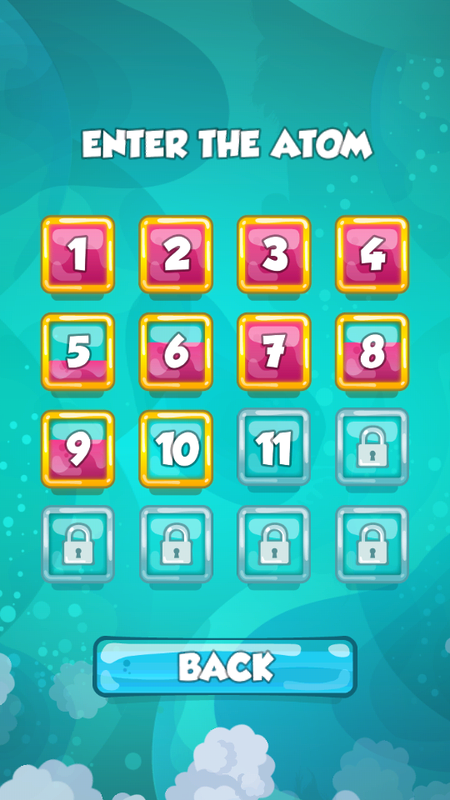 As with Angry Birds, there will be some levels you will be just happy to pass, nevertheless collect all three stars. It's worth noting that the specificity of pandas being shrunk down is very much a play at a "cute" factor; the sprites could have easily been antibodies and would have done the same job. However, it gives the game a (nonsensical) premise and it isn't shoved down our throats, so it gets a pass from me. The aesthetic of this game is really pleasing and polished, as even finger presses on the menu explode in a confetti of little pandas. Part of my judgment of a game is how easy it is to navigate its menus, and Nano Panda's interface works extremely well. I think there's an awful lot of polish put into this game, and it shows. I recommend it to anyone who likes a good puzzler with some unique physics, along with a number of different levels to keep you occupied. Nano Panda is available for half a British Pound, which works out to less than a dollar in Canadian and American currencies. I don't see any notice on the Market of this being a launch sale, but it almost seems too cheap to be true. 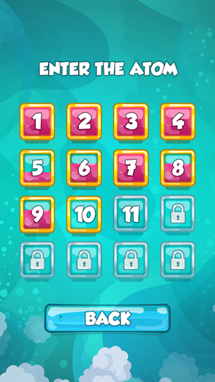 The free version only contains the first 13-level world, but if the price sticks, this could be a must-buy for the Android OS.